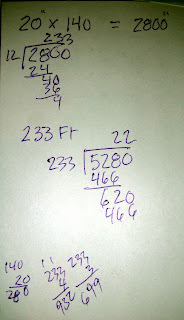 Season II -- Barefoot Mile Number 3 -- Calculations! 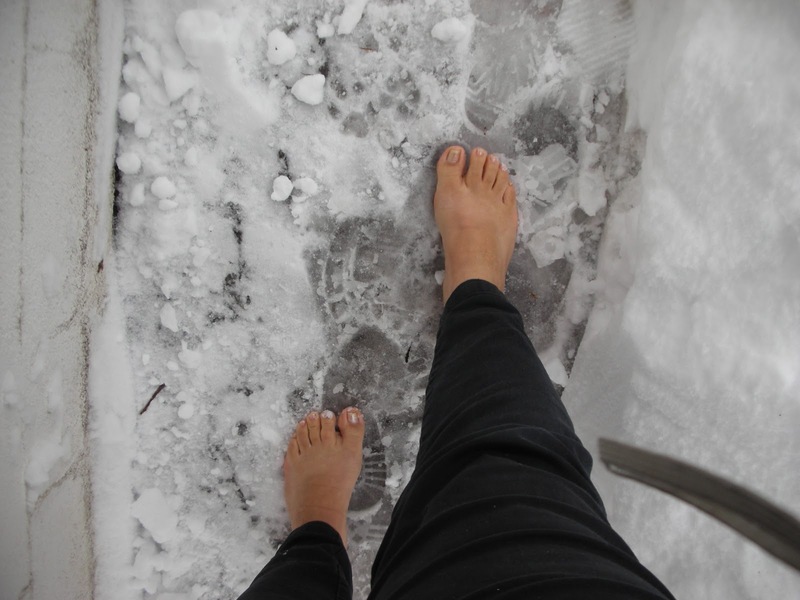 "Barefoot Running at the Indoor Track: Tonight or Tomorrow"
It was written to three of us and said she might be there tonight. I showed up, but there was no one there. Kiddies were having their free karate class in the gym below, just like last week. On the walk over, it didn't feel so bad out. 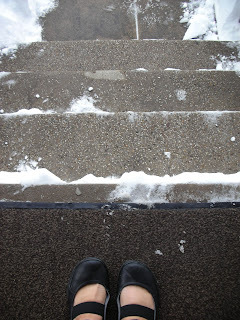 I thought, why am I going to this indoor track? I should just run outside. Then I remembered I was going because my friend might be there. And besides, it was dark. So, I started round the track. It was fun, I'll admit, but I was going to run further tonight so I wasn't sure how many times around the track would be about a mile. I decided to run around in sets of 10x around. I ran round and round. It was really hot. There were these old radiators in there and wow could they make it hot. Plus I was in the upper part of the room above the gym so the hot air had risen. But they had the windows open on the wall by the radiators so there was a cold breeze when I ran by the hot radiators. That was a weird sensation. I started to get bored going round and round without my friend to talk to. This is not much better than a treadmill, I thought. Although it is slightly better because I don't have to change my form to pawback or anything. And I can count the laps. Only I kept losing track of how many, so I think I "cheated" myself by counting some of them twice. I also started feeling a little tilted from running round the edges in the same direction. After 10 laps, I switched direction. I had thought that 10 laps might be about a mile, but after 10 laps it definitely had not felt like a mile. Maybe 20 laps is a mile, I thought. I decided to do 40 laps (remember: I'm still getting back into it after a month off, plus I have Kung Fu tomorrow). I decided to concentrate on breathing quietly and running softly and quietly without losing my composure. That was interesting enough to get me around all the laps. After finishing the 40 laps -- uggh! -- I tried to figure out how far around this track was. I walked with baby steps around the track. It was about 140 baby steps. My baby steps might be a foot long and they might not. When I got downstairs, I asked one of the kids taking the karate class if they knew how many times around the track was a mile. "24, I think." Wow, I sure did not eyeball that track well if I thought it might be half the size of a regular track! So, I got home and tried to do some math. 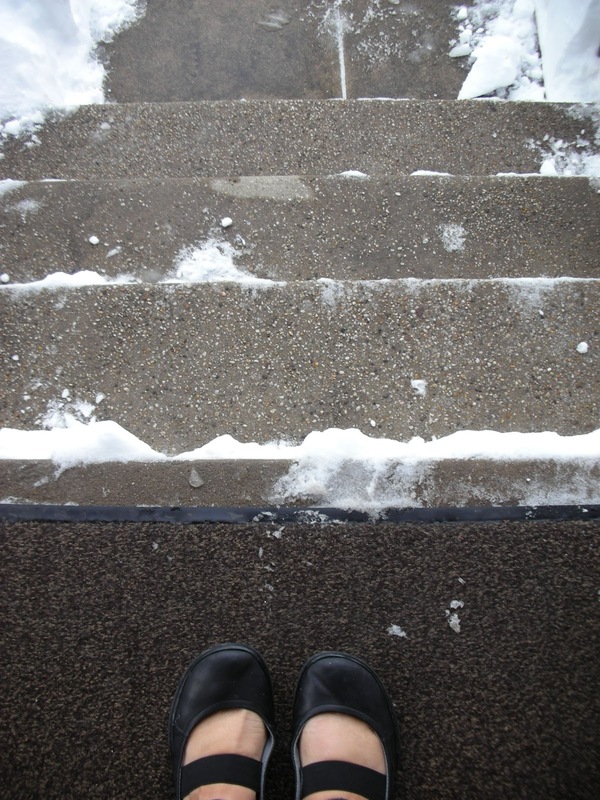 First, I tried to see how many inches my "baby step" was. I guessed it was about 20 inches. I multiplied 20 inches by 140 steps around the track: 2800 inches. 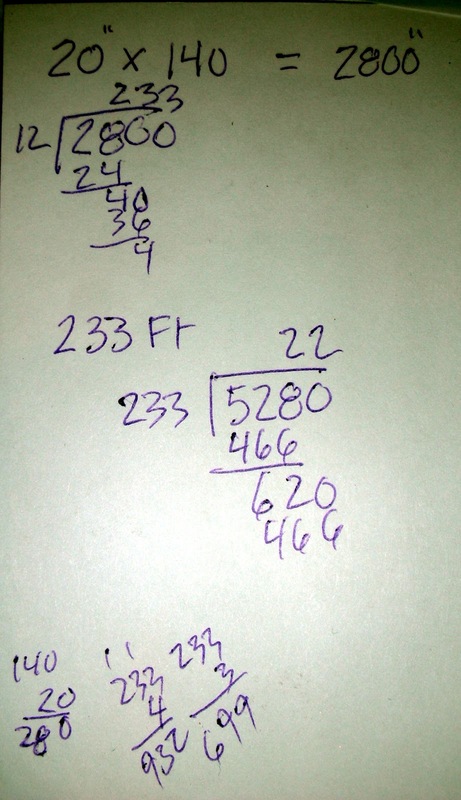 Then divided by 12 to get feet: 233 feet around. Then I divided the feet in a mile (5280) by 233 which came to roughly between 22 and 23 times around the track for a mile. Considering how inexactly I had taken the baby steps and how inexactly I had measured my step when I got home, and also considering how I felt after running 20 times around the track, I guess the kid is probably right that 24 times round that track is probably a mile. Now, why did I bother to try to roughly calculate that? Why do I need to know how far I went? Why do I need a measurement? While I was going around it was really bothering me that I didn't know how far I was going or how long I was running. So, I had this thought that maybe I could just listen to my body. Maybe I could just run until it seemed like fatigue would no longer let me keep my form well. I thought of non-dieting approaches to manage food that recommend paying close attention to body signals: eating when you are hungry and stopping when you are full. Maybe the same approach is good for running too. Let the body's wisdom determine the distance and speed. But it was hard to listen to the body's wisdom. I needed to have an idea when it was time to stop. I needed some predetermined amount to run. I decided on 40 times around the track ahead of time. I mean, what would happen if I listened to my body? What if it never wanted to stop and I was stuck there running round that track forever? Or, what if it told me to stop before I had run enough to benefit me? (Whatever that amount is?) What if endorphins kick in and I don't notice I'm overdoing it and end up with a repetitive stress injury? What if I give up and don't push myself beyond? (Beyond what?) What if there was no such thing as training for a race? A tempo run? A long run? What if I just ran for fun and did what felt good and exhilarating? And counting the times around will give me something to do. 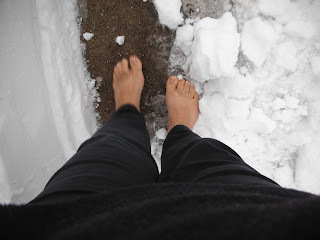 Season II -- Barefoot Mile Number 2 - Back Out There Barefoot! I remember the first few times I ran out there barefoot in the 40s and it seemed quite cold. 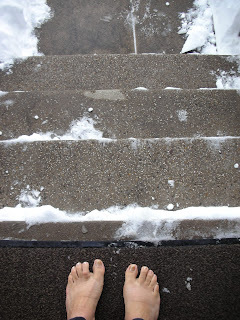 But after those few sub-40 degree barefoot runs I had back in December, and after those few tentative little walks out in the snow, this 41-degree-day today seemed so warm and comfortable. This was my first time running outside since I got back from the Run Disney Buzz and Woody's Best Friends 5K early in January. 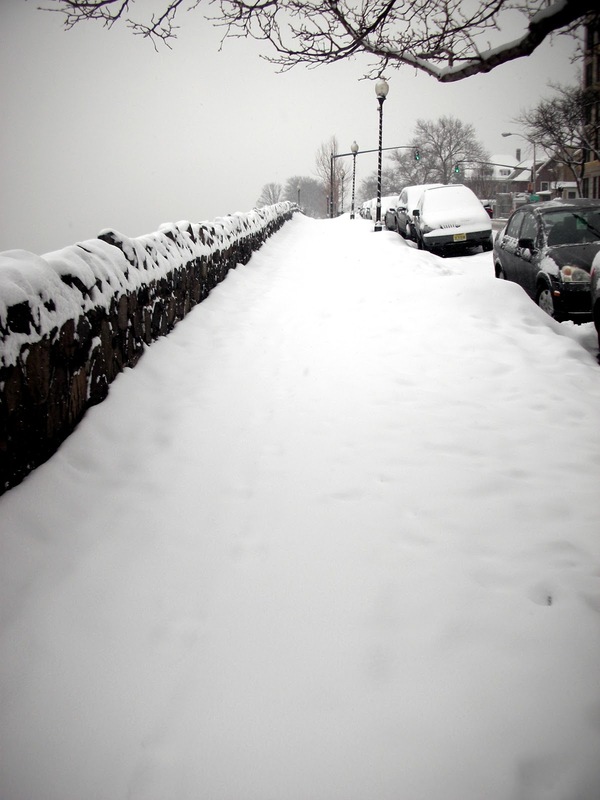 There were patches where there was some slushy snow in the way but I just ran through it. It didn't feel that cold. 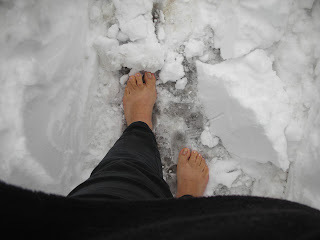 I ran an introductory "back out there" barefoot mile today. I didn't know before I went out how it might feel. After a month off would I have to start all the way at the beginning doing a quarter of a mile? Would it take a long time to work my way back? Well, that mile felt so good, and my feet feel so good now, that it is clear to me that the gains I made over the past season are with me, and that I will not have to start at the very beginning again. I have spent a few weeks just thinking about barefoot running, what my "goals" might/should be for my second "season" and exactly what it means in my fitness life. I have been influenced by a book I've been reading: Athletic Development: The Art & Science of Functional Sports Conditioning by Vern Gambetta. "Effective movement, especially high-level athletic performance, is the result of the interplay of the three movement constants; the body, gravity, and the ground. Understanding each of the movement constants independently is one thing, but the real key is to understand how they interact." "A better understanding of muscle function will allow training to be more focused, logical, and exact ... The focus shifts from "feel the burn" and "no pain, no gain" to an understanding and feeling of flow and rhythm in the movements." "Movement is gravity driven. Movement is a delicate balance yielding to gravity or being able to overcome it." "The interplay between force reduction, force production, and proprioception will produce the highest quality of movement." So, what does this mean? It means that as I ran along today I was more interested in the really sensing the relationship between gravity, my connection to the ground, the fluidity of my movements in relationship to the ground and gravity. 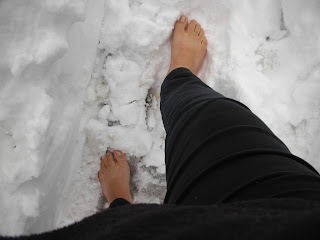 It means that I was interested -- throughout the course of one barefoot mile -- in really experiencing what the movement was all about as I ran barefoot along. It means that I was focused more on the quality of my movement and how my relationship to gravity felt while moving than how far or fast I was running. If Year One of my barefoot running was about being a beginner and just learning how to get out there and get my feet and body conditioned for some barefoot running, then I think Year Two is going to be, for me about the quality of the movements. Will my blog be slow-moving and boring because of this focus? I mean, if I don't run faster than I did last year, or if I don't run farther than I did last year, will it all fall into "the same ole, same ole" category? Perhaps. I am not planning to try to out-do myself this year. I am not planning any personal records. I am not planning to run farther and farther and faster and faster. I am merely trying to run better. I want to really understand what running movement actually is. I really want to try to feel and experience what my body is actually doing, how all the systems are working together with the ground and gravity. So, I hope it doesn't get boring, because since a lot of what I'm going for is a feel and experience, it might be hard to write about. Let's just say for now that I'm off to a good start with it. 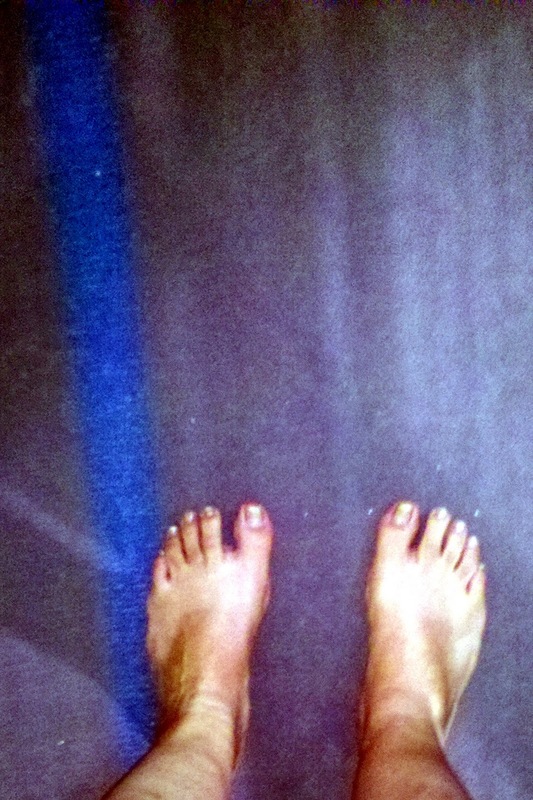 Season II -- Barefoot Mile Number 1 - First Time on An Indoor Track! 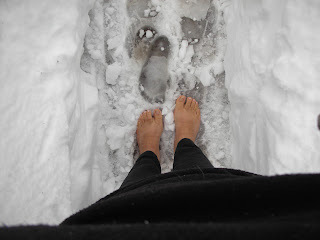 Well, bless my little barefoot heart, didn't I just have the answer to my barefoot winter prayers tonight! Just a couple of blocks away. You haven't heard much from me this January. As soon as I got back from the Buzz and Woody's Best Friends 5K down at Walt Disney World, two things happened to affect my running. First of all I got invited to black sash training at my Kung Fu school and have to be working out Kung Fu more frequently, and also going once a week to this very brutal black sash cycle training class. That threw off the balance of my workouts. In addition, before going down to the Disney 5K I had been motivated to train in the cold because I wanted to run that race barefoot. 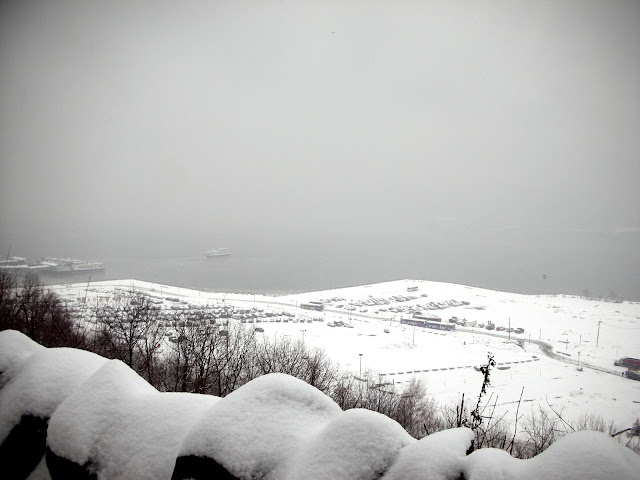 But once I got back, I couldn't face the cold again. 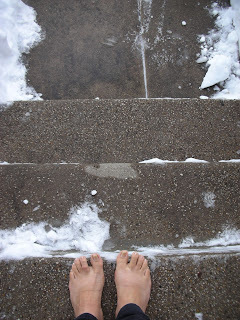 I decided that January was a good month to step back, think about things, get used to the stepped-up Kung Fu training and just decide what I was going to do with this barefoot thing in the middle of winter. I want to tell you something. I have a treadmill. In the basement. A really nice one that we got about 8 years ago. A True treadmill. But I just won't go near the thing. Just won't. Before we got it, I thought it would be a really amazing thing to own, but I found that I hated it. When I heard that people called it "the Dreadmill" -- a term I heard for the first time in the past couple of months -- I nodded my head in complete agreement. 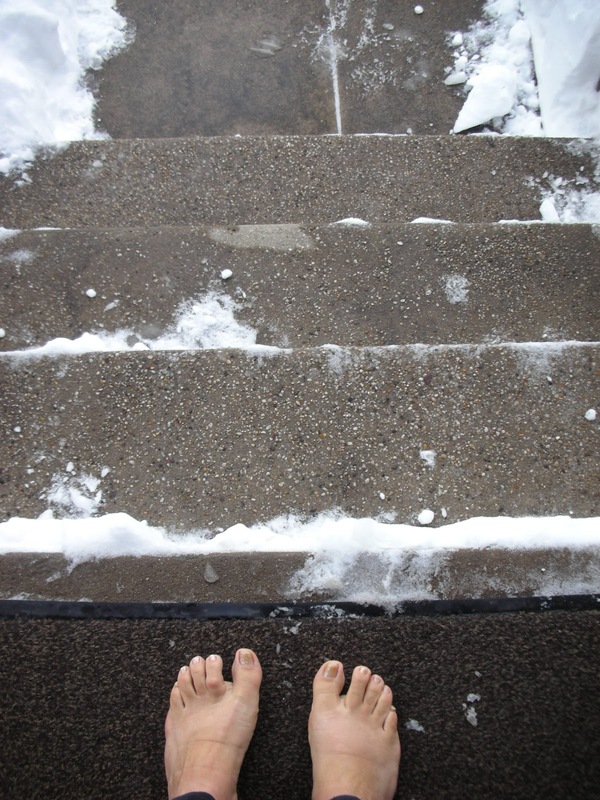 So, I have been in a state of paralysis about my barefoot running during this month of January. I simple won't use the treadmill, even though many times I tried to talk myself into it. And yet I just couldn't bring myself to run outside with shoes either! I toyed with just going out in the very snowy streets and just running barefoot. In fact, I took a movie just for you all of me walking a block and back. What you see by this is a girl who very much wants to keep running barefoot, but is dismayed by the weather. Like the last person who won't go home from the party -- doesn't want it to be over yet. So, rather than give in and go out there in my shoes, I decided to take a little break and see if the weather got any better and I could just continue barefoot. 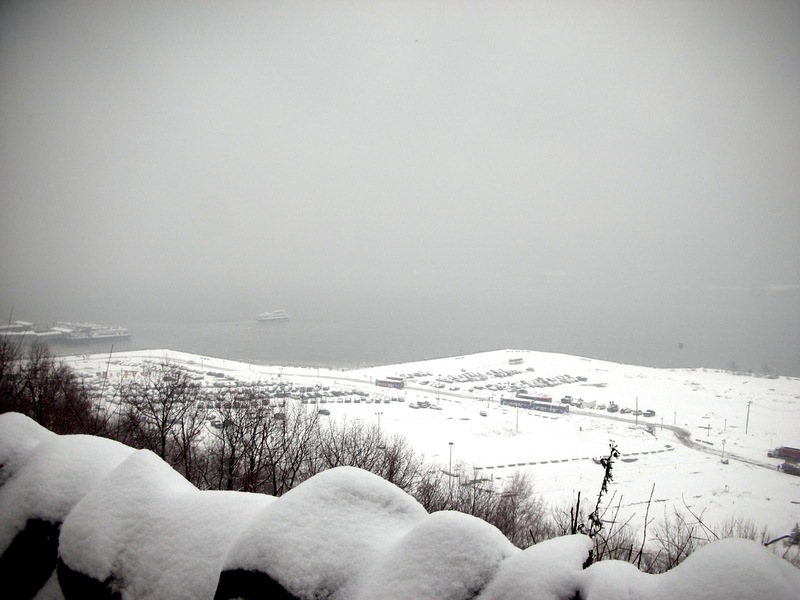 But the weather didn't get better, and we just kept getting dumped on and dumped on with snow. You've seen all the photos I've posted over the past Summer and Fall of the view I have of the City Skyline while running and how it's changed with the seasons? 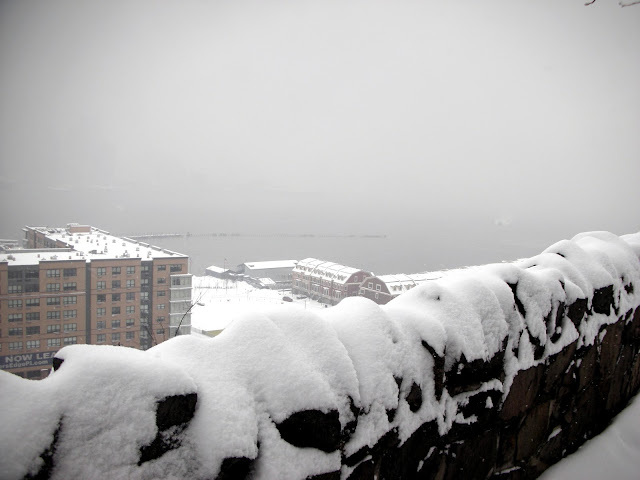 Well, one day, during a snow storm the view completely disappeared. So this barefoot girl was very bummed out. Very very bummed out and was just waiting to see what was going to happen. Would she run in her Vibrams again? Would she try the treadmill? 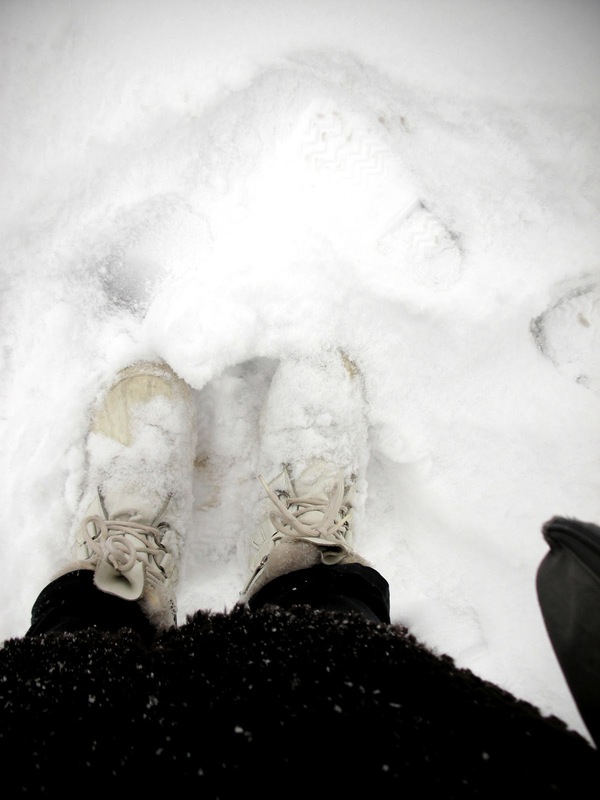 Would she try to go out in all that snow barefoot? 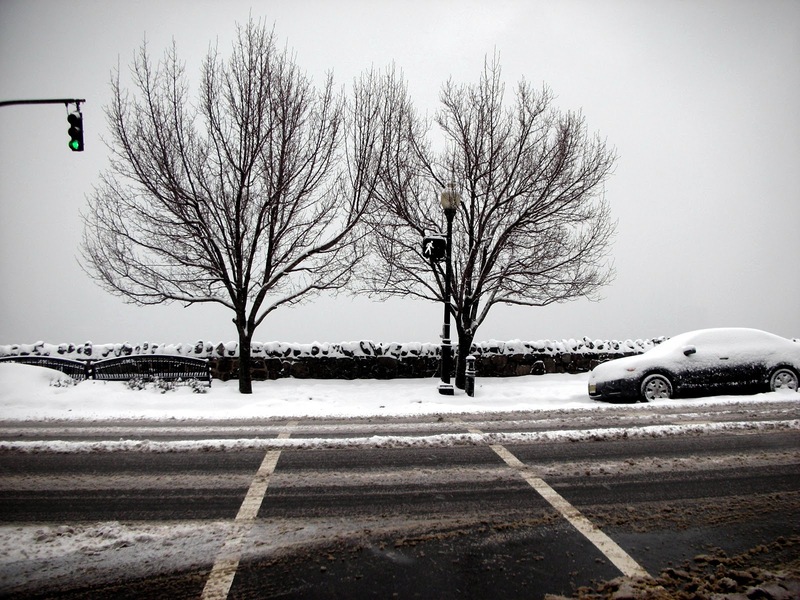 Would she wait until spring? 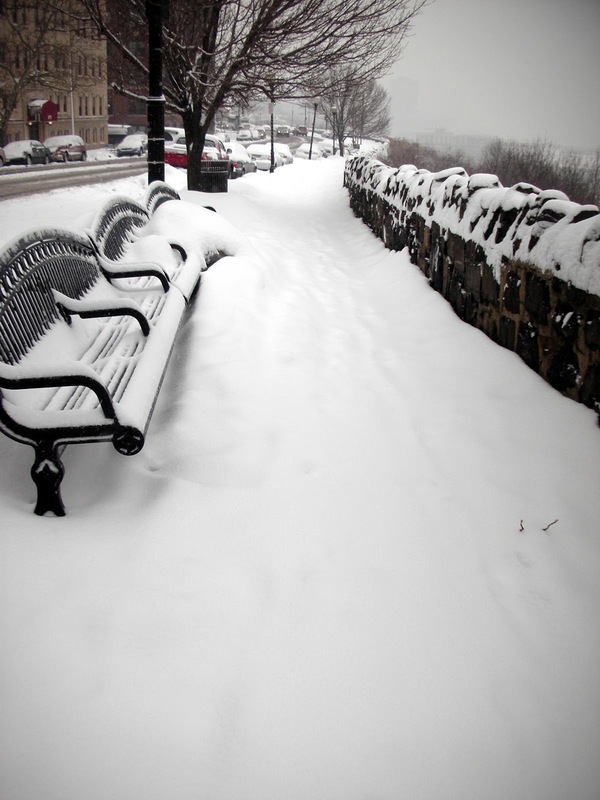 Had enough of the snow? 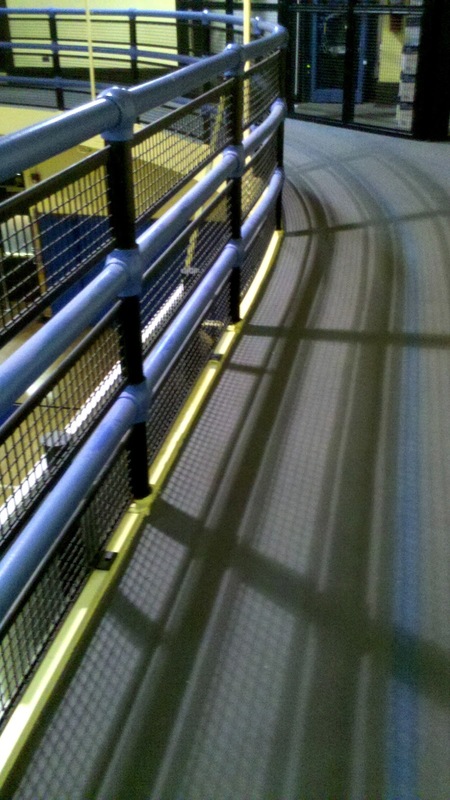 around the newly refurbished 2-lane indoor track! "let's get together and do a barefoot run sometime." So that's what we did tonight. We were the only ones who showed up to run, and my barefoot running buddy had on her winter boots, and I had on my Vivo Barefoot Kalis and when we asked about the track (you had to go upstairs because it was above the gym, as you can see in my first picture at the top of this blog) the lady looked at our boots/shoes and said, "you've got sneakers, right?" My friend answered really quickly, without batting an eye, "yeah, yeah, yeah." I figured the lady meant that we couldn't run on the track in our boots, and I didn't think it was necessary to get into the whole barefoot thing, right? The track was small. We probably had to run around it 10 times to make a barefoot mile. But it had a really cool kind of rubber, not too cushion-y, but soft enough to be a little bit of a treat surface. It was nubby and textured enough to make sure the skin got enough to keep it conditioned, but in no way felt uncomfortable or painful. It was really great. I had a really great time and I'm so glad we went. One of the recreation ladies did come up and take a glance at us running round and round on the track. She did notice us barefoot but just went downstairs. Later, when we were leaving, she said something like, "that track is not very soft," which I guess was referring to the fact that we had been barefoot. Inside, I couldn't help but smile. 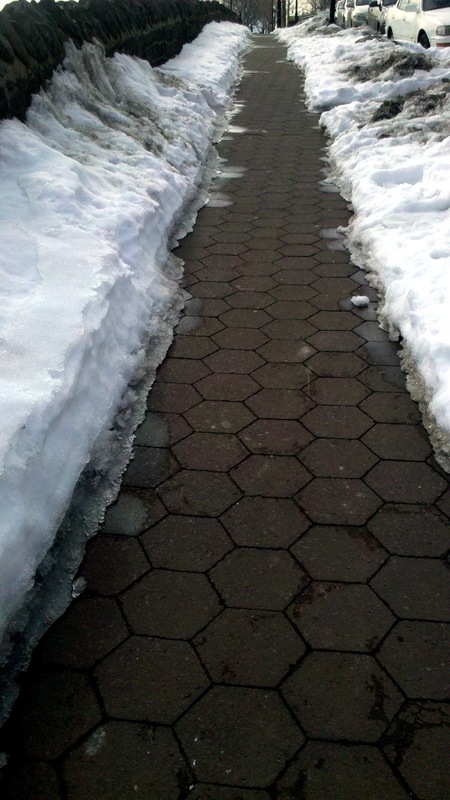 "Lady," I thought, "you have no idea how heavenly that surface is after running on the sidewalk all summer." But I did not voice that thought aloud. The only bad thing about it -- and it is a really bad thing -- is that I am completely busy with choir and Kung Fu every time the track is available. There is only one night a week that I can avail myself of it. But that's okay. I feel so happy I could burst, to just have had this little answer to getting me out of my barefoot paralysis.